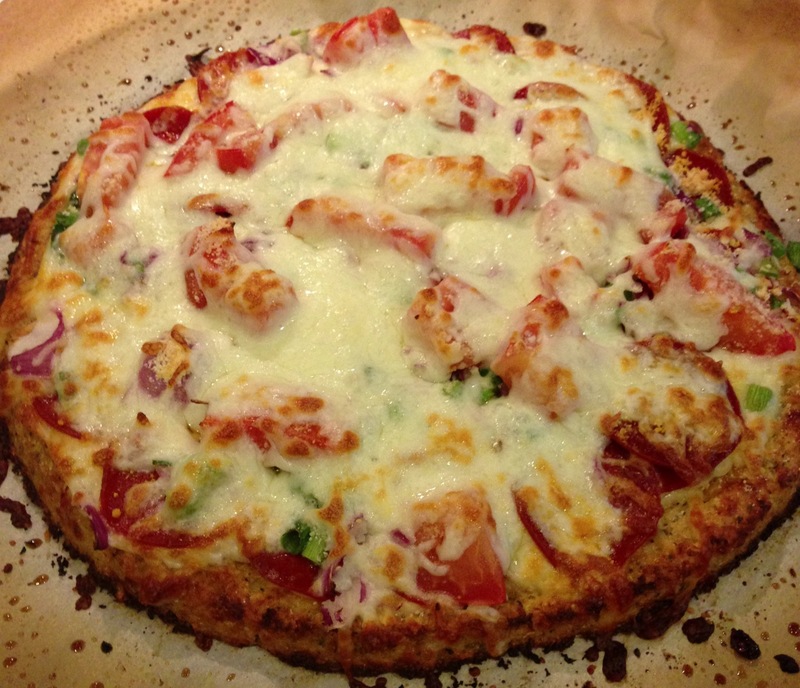 When I found out about almond flour crust pizza, I thought whoever came up with it was brilliant. That’s until I heard about cauliflower crust pizza. 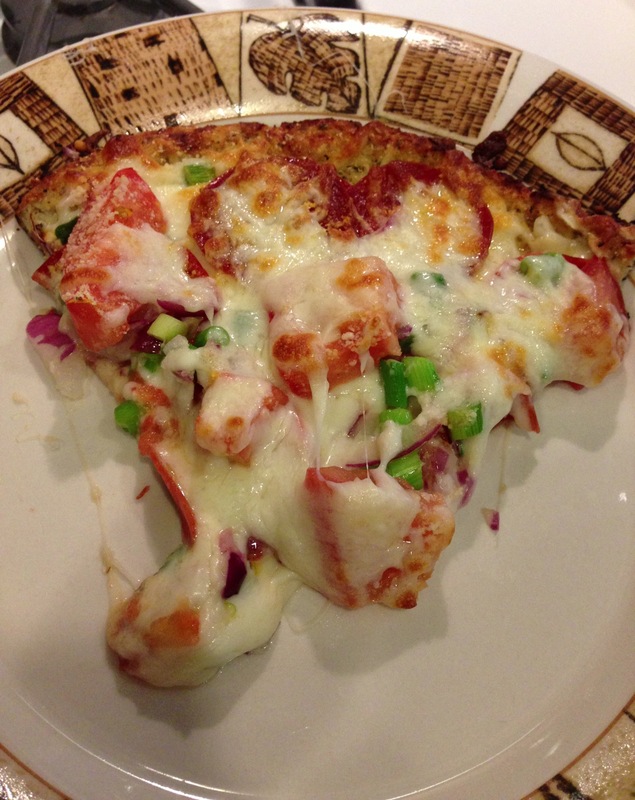 I heard of this amazing pizza crust a few months ago and had been itching to try it ever since. But, since I didn’t have a food processor and didn’t feel like grating the cauliflower by hand, I put it off. Luckily, I just bought a food processor, so, I’ve been trying out all sorts of recipes, including this one! Basically, I’m going to list out which parts of the two recipes I followed. The recipes call for medium heads of cauliflower. The cauliflower I bought seemed large, so, I used only half of it, only to have to go back and repeat the process to use the other half, since it barely yielded any “dough.” After food processing my cauliflower, I microwaved it for 4 minutes, like the first blog, The Lucky Penny, says. I also used all of the ingredients she listed in order to make the crust (which, I must add, turned out to be amazing! ), including the almond meal, minus the red pepper flakes (I used regular black pepper.) Adding the egg white is listed as optional but I advise you use it because it helps the dough bind together better. I found that without the egg white, my dough wasn’t adhesive. I used Closet Cooking’s cooking times, since my pizza crust was pretty thick. I baked my crust for 20 minutes. You’ll notice when it’s done, as it’ll give off a nice light golden brown color. After taking it out of the oven, I layered my pizza with mozzarella cheese (as much as you want), spinach, green onions, red onions, tomatoes, and turkey pepperoni. For those on the SCD, we can’t eat commercially bought pizza sauce, so, I left that out. I then put a final layer of mozzarella cheese on top, in order make all the toppings stick. I put my pizza back in the oven and baked for 10 minutes and broiled for another 3 minutes. Just remove your pizza from the oven when your cheese melts and begins to bubble. When it’s ready, you’ll be able to tell. My first impression of this pizza was that it’s absolutely incredible! My husband is often my guinea pig, since he gets to try my recipes before they, “hit the public.” He seriously couldn’t stop talking about how fabulous it tasted. You really can’t tell it’s not “real” pizza, either. The cauliflower taste isn’t even noticeable, especially since the pizza crust recipe is jam packed with all those flavorful herbs! Plus, the only real fattening part of this pizza is the cheese, so, really, how can you go wrong with this recipe? I can’t imagine how much more amazing it would have tasted had I added some sauce to it but we didn’t notice any difference in flavor. The best part is that the actual crust looks like real pizza crust. Just be sure to ring out all the water after you microwave your cauliflower, so that your crust doesn’t become soggy. We probably wrung out about a cup of water. If you’re like me and don’t have much hand strength, ask your husband or significant other to ring it out for you! I urge you all to try this incredible pizza! If you have kids and are trying to sneak some healthy options into their meals, I guarantee you they will love this and that they won’t be able to tell the difference! This pizza looks so delicious and inviting and the photos are great too! Thanks so much for the stop-over, I appreciate. Have a pleasant week!